I love walking in the woods, scrambling up mountains, observing nature, cooking, reading, writing, a number of arts and crafts and Tai Chi. I de-stress by doing jigsaw puzzles (go on, try it – you’ll be amazed by their therapeutic ability) and my life would be a lot less enjoyable without Earl Grey tea and cake. 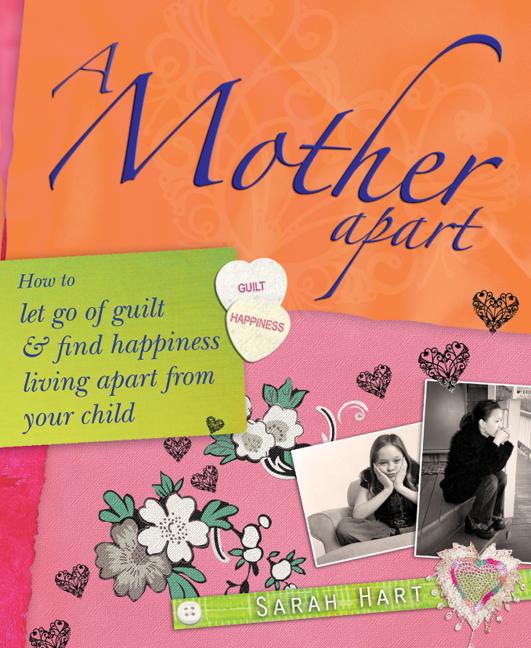 I have just finished reading your book ‘A Mother Apart’- it has helped me a great deal- though some of the book did not apply to my situation. My husband & I divorced in March 2004 after 20 yrs & 4 children. My second son (who was 16 at the time- the same age as I was when my parents divorced), treated me with total disrespect as his Dad was not here to tell him off- and he knew it. Plus he did not like my new partner and used to embarrass me when he was around. I put up with his behaviour for over a year and he was making me ill so sent him to live with his Dad(he would not take him as he was in a 1 bed flat so sent him to his Grandma) he never liked or got on with her so it made it worse. Since then he has not spoken to me- it will be 3 yrs in August, plus he had a baby last Sept with his girlfriend(they had only been together 1 month!) both 19- when I went to the hospital he refused me entry to see her!! so she is now 8 months and I have never seen her. It is so painful as you can imagine. I send things for the baby & cards but get no reply- now they have moved and I do not know their address. I think of him everyday and wonder how he is doing and miss him- even after all the pain he has caused me. That is why I joined MATCH and heard about your book- thank you! Thank you for leaving a comment on my blog. It was good to hear from you but I’m so sad to hear about your painful situation with your son and little grand daughter. Your son sounds like a very angry young man who has a lot of feelings about his past to deal with at a time when he is required to take on the enormous responsibility for his own child. Without wanting to cause you more distress, it’s my experience that reconciliation with children we have lived apart from after family breakdown is often a long and painful process. Working through any feelings of rejection and confusion takes time and maybe he needs a few years to be able to reflect on what happened with the perspective of an adult, instead of the idealism of a young man. It’s important to try and stay in touch. Do you know where his girlfriends parents live, perhaps you could ask for an address? Would it be possible to ask your ex, or have a third party ask for you – an uncle, aunt, cousin or even one of your son’s friends? Does he have a Facebook account? As painful as it can feel to keep sending letters/messages/presents into what feels like the void – if you can find a way, I believe it makes a difference. Even if it takes a while, even if your son is rejecting, he will see how much you care through your attempts to try and maintain contact. Keep it light, little and often. It will be easier for you too that way, as it isn’t easy having a one sided relationship anyone, let alone your own child. If you can’t track him down, try every now and again and make a log of what and you’ve done and the date. If you feel up to it, put birthday cards you would have sent to him or your grand daughter into a box. Try keeping a journal of things you’d like to say to him. These and other things will perhaps one day demonstrate to your son, how much you love and miss him. Very importantly, you will also be honouring the love and commitment you have for your son within yourself – that just because you had difficult times when you divorced his father doesn’t mean that you ever stopped being his mother who loves him. Look after yourself Joanne, do you best but make sure you live your life to the full and make yourself happy. You know where to contact me if you feel you’d like some counselling to help you process with some of these difficult feelings or find strategies for managing life as a mother apart. Wonderful service you are providing.